L-Glutathione is a biologically active, naturally occurring tripeptide composed of cysteine, glutamic acid and glycine. Maximised L-Glutathione provides a high potency source of L-Glutathione. Of its many roles in the body it is best known as a powerful antioxidant. Antioxidants help to neutralise harmful free radicals that are produced quite naturally in the human body and which, if allowed to proceed unchecked, can harm tissues and organs. Glutathione is found at very high concentrations in the lens of the eye, and plays a vital role in maintaining healthy eyesight. As a food supplement for adults, one (1) Vegetable Capsule of Solgar L-Glutathione daily with juice or water in between meals, or as directed by a healthcare practitioner. 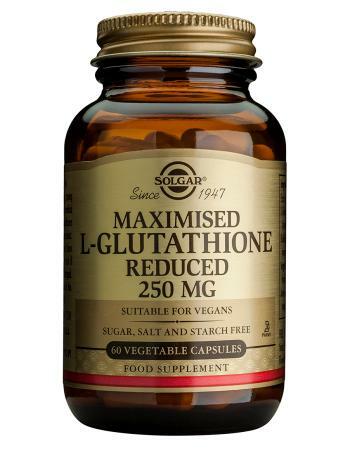 Solgar Maximised L-Glutathione is suitable for Vegetarians, Vegans. Kosher.